Hello, readers. Welcome back to Drink Read Love, and Happy Hump Day! I know it’s been a while. Things got a bit hectic in real life, but I’m getting back in the saddle. And what better way to get back in the swing of things than with a great historical fiction novel by one of my favorite authors? 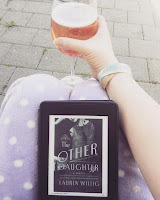 Today we’re going to talk about none other than The Other Daughter by Lauren Willig. I first discovered Willig’s books late last year, when I was doing a lot of reading when my family moved and we were living in a hotel. I had a lot of down time, especially when doing laundry at night. I can’t remember exactly how I stumbled upon Willig but I am *so* glad I did. I read one of her books (I also can’t remember which one I read first, it’s a very hazy time in my life, lol) and proceeded to read a lot more, and she moved right on up the ladder to be up at the top of my list of faves. One of my favorite books she’s written, if not my very favorite, is The Other Daughter. The Other Daughter is set in 1927. We first meet Rachel Woodley in France, where she is working as a governess. One night, as she and her young charges are watching the Easter Ball being hosted by their parents, Rachel is given a telegram. The telegram bears the bad news that Rachel’s mother (a genteel widow who lives in England) is sick with Influenza and requesting Rachel’s immediate return. Rachel immediately rushes home but is too late. As she cleans out her mother’s cottage, she finds a clipping from a London society paper. Much to Rachel’s surprise, the clipping – dated only 5 months before - is of a man who looks exactly like her father, whom Rachel had been told died years before. Adding to the shock is the fact that the man is pictured with a young woman who is his daughter, but she is not Rachel, as well as the fact that the man is an Earl. Wanting to find out the truth, Rachel sets out for Oxford to visit her Cousin David to seek the truth. It turns out that Rachel’s father did not die, and he has a legitimate, acknowledged family. Rachel is shocked and angered at the knowledge that her life, name, history, and ancestry have been a lie. Ok. So, my review. I LOVE, l-o-v-e, this book. I read through it a bit fast the first time b/c I was dimply dying to know what happened next, and the end result. After I read it, I had to go back and read it again, just to absorb the details I missed the first time. This is definitely a book that requires careful reading and rereading. It is masterfully crafted with multiple layers that peel back, showing a deeper picture with every reading, sometimes with merely the turn of a page. Aside from the romance, the mystery, the drama, and the adventure, I love the emotion. Willig is a virtuoso playing the violin of my emotions, stirring heartache and laughter, smiles and tears, and making you feel what the characters in the book are feeling. It goes beyond reading words printed on a page, it is an immersive experience rather like finding yourself in the midst of the scene, as though it were happening to you. Willig addresses PTSD in soldiers who have been in combat, grief, death, the intricacies of finding out your family is harboring some unpleasant skeletons in a hidden closet, and more, without becoming overly heavy, preachy, or tedious to read. I cannot recommend The Other Daughter highly enough. My only caution is that Willig is one of those authors who draws you in. Not only was it difficult (to say the least) to put this book down, I immediately went and got more of her books to see what else she had written. I also have to throw in a plug for Willig’s website and Facebook page. Lauren Willig is a very interactive author. She hosts giveaways, interacts with people who comment on her Facebook, and has all sorts of extra background material for her other books (especially the Pink Carnation Series) on her website. It’s a joy to browse both her website and her Facebook, so head on over to check them out. You can find her website at http://www.laurenwillig.com and her Facebook page at https://www.facebook.com/LaurenWillig so head on over and check it out, and join the conversation. Last but most certainly not least, the question of What To Drink with The Other Daughter. I found that my new favorite rose moscato (and one of my favorite wines in general), Villa Jolanda, went GREAT with this book. I felt sophisticated drinking a bubbly pink wine from my wine glass while I read. It also added a little something of authenticity to feel like I was drinking something similar to what The Bright Young Things did in the book as I read about them drinking bubbly drinks. This wine is the one that totally revolutionized my views of wine and how delicious it could be. As a side note, I figured out the other day that you can add ice cream to your glass of this deliciousness and have a rose moscato float. SCORE! Thanks for reading! Check back with us later this week when we’ll have an Author Q&A with Lauren Willig. You can find The Other Daughter on Amazon, in hard copy and Kindle format.